Suited To The Seasons: Put 'em Up! I was recently cruising one of my local book stores and found Put em'Up! 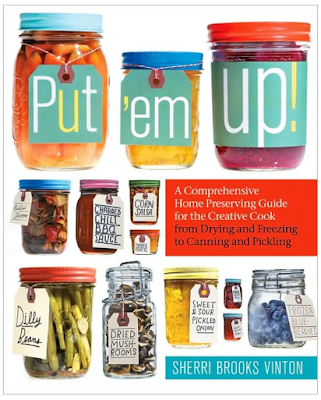 : A Comprehensive Home Preserving Guide for the Creative Cook, from Drying and Freezing to Canning and Pickling by Sherri Brooks Vinton. This book is perfect for me with simple, well written, how to instructions; excellent step by step illustrations; delicious recipes; and a hip and contemporary layout. This book gives a modern twist to the old art of preserving foods. My beans are just beginning to mature and I should have a great crop to harvest. I'll be trying the Spicy Szechuan Beans recipe first!